What brakes are you running now Sean, did you bin the standard 4 pots for something bigger? Running R33 skyline all alloy calipers (4pots front and 2pots rears) ebc yellows pads all round, for some reason the yellows work well on my car. Car only weights just over 1 ton, with 380bhp the datsun was loving the sticky tarmac on the rears. Are they the Brembos? 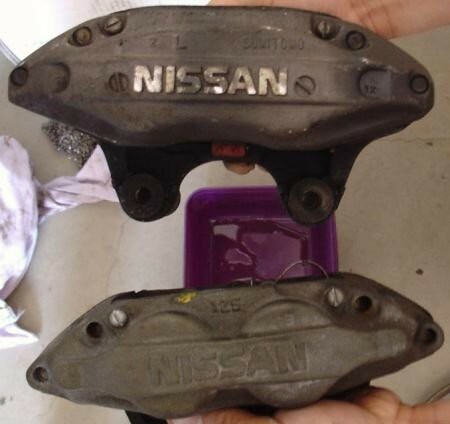 Realise the standard Nissan 4 pots are the same caliper as the Subaru ones, just wondered if the caliper mounting points were the same, may be an option for Subaru brake upgrades if the Caliper mounting is the same. I have the Sumitomo calipers all round, which are the same as the subarus, put mounts are different on some, I know the pads on mine fit subaru wrx, mazda rx7, and some evo's. So you have the top ones rather than the bottom? Sorry for all the questions, I'd ike something a little bigger on mine but don't want to ditch the 17" wheels, not many upgrades that fit other than the Prodrive Alcons (like rocking horse ****e) or a new set of smaller Brembos from Godspeed which are around the £1k mark. I have the top one, theses are made from alloy. Seriously recommend you steer clear of Godspeed.